When the funky Hyundai Veloster hatchback first debuted, it had practically everything going for it except speed. But these are power-hungry times, so scribes like us were quick to jump on Hyundai for not offering more horses under the hood. That's no longer an issue, however, because the 2015 Hyundai Veloster boasts not one but two turbocharged variants: the regular Turbo and the sporty R-Spec. Not surprisingly, we're struggling to find anything amiss these days with Hyundai's hot hatch. The Veloster Turbo is a big deal because it's both fun to drive and remarkably affordable. It undercuts the price of comparably equipped rivals such as the MINI Cooper S and Volkswagen GTI by thousands. Like every Hyundai, it's backed by a stout 10-year/100,000-mile powertrain warranty, so if you're skeptical about turbo reliability, Hyundai has your back. Don't sleep on the even more affordable base Veloster, though, because it's fundamentally the same car minus the turbocharger, so you get the same sporty handling and surprisingly refined high-speed demeanor, plus extra fuel economy. Either way, it's getting harder and harder to nitpick with this happy-go-lucky Hyundai. The Veloster is unchanged this year. The base Veloster is powered by a 1.6-liter 4-cylinder engine rated at 138 horsepower and 123 lb-ft of torque with the 6-speed manual transmission. If you specify the optional 6-speed dual-clutch automated manual, output drops to 132 hp and 120 lb-ft. Fuel economy is pretty good, checking in at 26 miles per gallon in the city and 35 mpg on the highway with the stick shift and 27 mpg city/36 mpg hwy with the automated manual. Opt for the Turbo or R-Spec, and you'll get a spunky turbocharged 1.6-liter 4-cylinder rated at 201 hp and 195 lb-ft of torque. A 6-speed manual is standard, while a 6-speed conventional automatic is optional (the automated manual is only offered on the base model). The manual returns 24 mpg city/33 mpg hwy, while the automatic gets 24 mpg city/31 mpg hwy. 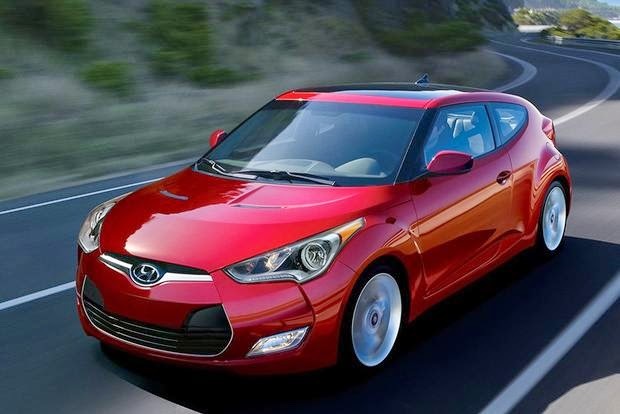 The 2015 Hyundai Veloster is offered in base, RE:FLEX, Turbo or R-Spec trim. The base Veloster ($18,825) comes with a robust roster of standard perks, including 17-inch alloy wheels, LED exterior accent lights, a center-mounted trapezoidal exhaust outlet, air conditioning, cruise control, a tilt-telescopic steering wheel, a trip computer, a height-adjustable driver seat, and a 6-speaker audio system with a 7-in touchscreen (including a rearview camera), Pandora radio capability and iPod/USB and Bluetooth connectivity. The base model is eligible for two packages. The Style package adds 18-in alloys, a chrome grille surround, fog lights, a panoramic sunroof, an 8-speaker Dimension audio system, piano-black interior accents, leatherette seat and door trim, a leather-wrapped steering wheel and shift knob, and alloy pedals. The Tech package (which requires the Style package) tacks on rear parking sensors, different 18-in alloys with painted inserts, automatic headlights, keyless entry/start and a navigation system. The limited-production RE:FLEX ($22,775) is essentially a base Veloster with the Style package's features as standard, also adding chrome exterior accents and black or red leather upholstery. The Turbo ($23,425) steps up to the plate with a turbocharged engine, an electronic limited-slip differential, unique 18-in alloys, exclusive exterior styling elements, center-mounted twin circular exhaust outlets, heated leather sport seats with Turbo embroidery, a quicker steering ratio and two thin-film-transistor (TFT) driver-information screens. A Tech package for the Turbo combines elements of the regular Veloster's Style and Tech packages, highlighted by the rear parking sensors, panoramic sunroof and navigation system. It also throws in automatic climate control. The R-Spec ($22,425) is an edgier, slightly less luxurious Veloster Turbo with some aggressive touches, including exclusive design cues, a sport-tuned suspension, red-trimmed leatherette upholstery and a sport shifter. Cargo space in the hatchback Veloster measures 15.5 cu ft. by default and 34.7 cu ft. with the rear seatbacks folded down. The 2015 Hyundai Veloster comes with standard stability control, a driver-side blind spot mirror, 4-wheel anti-lock disc brakes and six airbags (front, front-side, full-length side-curtain). In government crash-testing, the Veloster received the top 5-star rating overall, including four stars for front impacts and five stars for side impacts. The independent Insurance Institute for Highway Safety gave the Veloster its top rating of Good in three of the five tested categories, downgrading it to Acceptable (second-best out of four ratings) for side impacts and Marginal (second-worst) in the small-overlap front test. Our interior evaluation of the Veloster left us impressed with the base model's front seats, as they feature more lateral support than we're used to feeling at this price. The turbocharged model's sport front seats are even grippier. Common to all trims is the spaceshiplike dashboard, which looks so cool that we're inclined to forgive the mediocre materials employed. The tilt-telescopic steering wheel offers ample adjustability, while the clean, crisp gauges are complemented in the Turbo by a pair of graphically dazzling TFT information screens. Ergonomics are surprisingly good for such an adventurous design, particularly the foolproof climate controls. 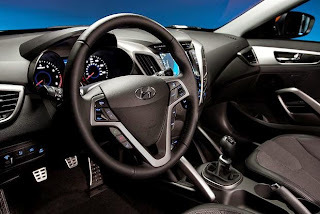 Access to the Veloster's back seat is via a conventional forward-hinged third door on the passenger side. It's like a 4-door hatchback without the driver-side rear door. 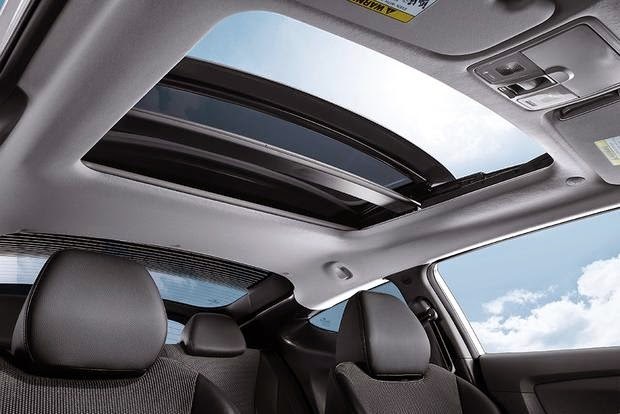 That means the rear door opens independently, unlike the so-called suicide door that some other 3-door cars have utilized, so rear passengers are free to enter and exit as they wish. Passenger space in back is mostly fine, but taller riders won't have enough headroom. The Veloster's standard 7-in touchscreen really sets it apart when compared to other affordable hatchbacks. Hyundai knows its target buyers want to be on the grid at all times, so virtually every imaginable connectivity feature comes standard. You can also crank tunes from Pandora if you've got an iPhone. The one notable disappointment is that the optional navigation system isn't hard-drive based, so you can't store your music on it. Under the hood, the Veloster's base engine needs all the horses it can get, so our preference is for the satisfying stick shift with its added output. Also, the automated gearbox could use some more development to sharpen its sometimes clumsy shifts. Cost being no object, the pick of this litter is undoubtedly the turbo, which provides most of its ample torque under 2,000 rpm thanks to twin-scroll technology. The enhanced engine pulls like a train on the highway, even in sixth gear. It can motor. On the road, the Veloster's steering feels a bit artificial, even in quicker-ratio Turbo form, but it's responsive enough to be entertaining. The Veloster's wide front track is palpable, keeping the car mostly planted to its handling limits. On the highway, meanwhile, the Veloster is unexpectedly an absolute champ, tracking straight and true at speeds we're not allowed to mention. It's downright Germanic, really. We're less enamored by the way the chassis flexes over rough pavement, but hey, let's be honest: Hyundai did a darn good job tuning the Veloster's ride and handling. 2015 FIAT 500 -- The 500 has a power shortage of its own unless you pony up for the turbocharged Abarth. Nonetheless, it has plenty of Italian style if you're looking for a little more sophistication. 2015 Chevrolet Sonic LTZ -- No motivation issues here, as the turbocharged Sonic LTZ has plenty of zest for squeezing through traffic. It's a surprisingly comfortable car on the highway, too. 2015 Honda CR-Z -- Honda's odd hybrid-powered coupe only has two seats, but it gets better overall fuel economy than the Veloster, and we like its slick 6-speed shifter and futuristic interior. Used Volkswagen GTI -- VW has a thriving certified pre-owned program with an attractive factory warranty, and the more luxurious and capable GTI can definitely be found in lightly used condition for Veloster money.